18 March 2019 Brian Noakes has added to his memories which can be found here. 22 February 2019 Brian Noakes who was originally from Southend-on-Sea has been in contact. His family went hop picking for John Levett at Park Farm on the Junction Road. His memories and photos can be found here. 5 December 2018 Some Bodiam Football Club up dates for 1982/83, 1983/84, 1984/85 and 1986.. My brother, Mark Ennis has assisted with the dates and names but any corrections gratefully received. You will see on the main table two entries for 1984/85, one with a ? In this the cup being presented to Ross looks like the Hawkhurst Charity Cup but is it for 1984/85? The links can be found here. 4 December 2018 An update on the entry for 24 September below. Mike Armitage has discovered that George Henry Wagstaff lived at New House Farm Brightling. 24 September 2018 I have been contacted by Geoffrey Elster. 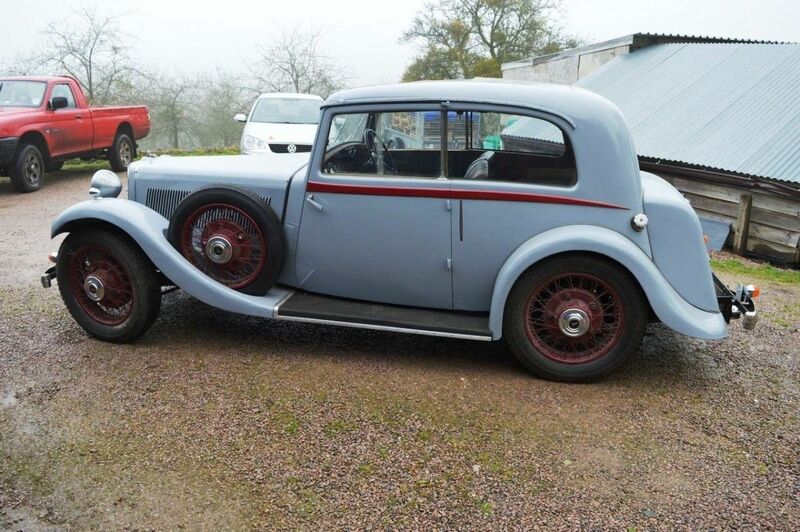 He is restoring a 1935 Armstrong Siddley. Apparently it was registered to Mr George Henry Wagstaff at New House Farm, Robertsbridge from February 1946 until August 1967 and he would like to know anything about him. At first I thought there must be another New House Farm in Robertsbridge but everytime I search Google it only comes up with New House Farm, Bodiam, Robertsbridge.. I know that the Elsams were living at New House Farm at that time but I have not heard of George Wagstaff. Is anyone able to help Geoffrey? A photo of the car can be viewed here. 9 August 2018 Geoff Sutton has also let me have some photos of his time at New House Farm. They can be found here. 1 August 2018 Geoff Sutton who, as a student, worked during hop picking in the late 1950s has let me have his memories of working at New House 2 Oast . 1 March 2018 Three photos of Joe and Elsie Mulhall at the Castle Inn. 11 December 2017 A couple of new photos today. The first is of School Children at Bodiam Church and the second is of Basil Bambridge and his wife. 30 November 2017 Patrick Jeffery and his family came hop picking in the 1950s and 60s and stayed at Park Farm. He has sent me some photos which can be viewed here. 14 November 2017 Val Relfe, who lived at the Post Office/Shop has let me have two postcards of the Post Office, one of the School House and some memories she has of living in Bodiam. 19 March 2017 Noll Cheadle has let me have a photo taken in 1974 when he was working on the hop farm. It can be viewed here. 17 March 2017 Michael Lawrence has been in touch regarding the recent death of his father, David Lawrence. More details can be found on the Message Board. 5 June 2016 This weekend I have learnt that Martyn Lawrence, sadly, has passed away. As a tribute to Martyn, I have posted a poem he wrote about my father, Rex Ennis. It is titled "My First Hero" and it can be viewed here. Over the past few day I have been updating and adding new material to the Guinness Time Articles page. 28 January 2016 Several additions to the Bodiam Football Club pages. I have revamped the title page and added several new photos and details. For these I need to thank Alan Karn, especially for the detailed information for season 1964/65 and Joe Duggan. Joe lived at Peters Green and played for the team in various years. He recalls an ex POW playing at some stage and thinks his name was Hans. Can anyone help? Christine Loughnane has been in touch. She was going down memory lane and searching Bygone Bodiam. In doing so, she came across the photos of her mother, sisters and herself on the Camp Life page. I have now been able to update the page with names and let Christine have new copies of the photos. 14 July 2015 This is a request for Mike Shade to get in contact with me. I have lost your email address and someone from the Lotus Seven Register would like to contact you. 16 June 2015 Paul Saville, who worked at Gunness as a student has been in touch. He has some memories of his time working at Bodiam which can be found here. As you will see, he is interested in making contact with anyone who remembers him. 27 February 2015 In June 2012, I posted a report by Robin Quinn on the Bodiam Bridge Accident. Robin has recently been in touch to let me know that details of the accident are included in his recently published book called "Hitler's Last Army". More details of the book can be found at Robin's website at www.robin-quinn.co.uk. 28 November 2014 Sorry for it being so long in posting anything. Today is a request for information. I have updated the page on the Bodiam Home Guard with some interesting information. Can anyone help with confirming the names of those in the photograph? I would like to know which Brabon is on the right hand side, who is the man to his right and is Bill Sands the right name for the person next to him? In addition, do you know anything more about the Bodiam Auxillary Unit Patrol? If you can help, please let me know. 26 May 2014 The three 1965 editions of Salehurst, Bodiam and Robertsbridge News added. I think this concludes the contents of the Jubilee Scrapbook. A new Pancake Race photo can be found at the bottom of this page. Can anyone help with the missing names? 25 May 2014 Two items where I am requesting help. The first is the Ladies Hope who were at South Park at the Junction. I understand that they had a renown stud for Shetland Ponies. Does anyone have any information about this. The second is a photo that appears on this site. It is of the Bodiam Cubs at the White Rock minature gardens. The photo in question has featured in the Ewhurst and Bodiam Parish News and it would be nice to know who the cubs are. The photo is the last on the page can be accessed here. I have put my thoughts on who the cubs are. Can anyone confirm please? 22 May 2014 Pages 25 to 81 of Jubilee Scrapbook added. 30 March 2014 Pages 19 to 24 of Jubilee Scrapbook added. 25 March 2014 As well as the Football and Cricket information, Alan brought the Bodiam Women's Institute Jubilee Scrapbook which was compiled in 1965 for the Women's Institute Golden Jubilee. I have copied the Scrapbook and have started to put pages on the site. Details can be found at the Bodiam Women's Institute page. 13 February 2014 Alan Karn has recently been in touch and has supplied some details of Bodiam Cricket and Football clubs. I have started to put some of this information on the site about the Cricket Club. This information can be found here. 10 January 2014 Marion George has been in touch and has identified herself in one of the hop picking photo as the "one with the black hair and awful fringe". The photo can be found here. 31 December 2013 Bodiam Hill Climb. Rupert Lloyd Thomas has been in contact regarding Bodiam Hill Climb. He has supplied the names of the drivers for one of the 1962 photographs and a report of the event.. He is working on a history of Bodiam Hill Climb and would appreciate any information on the event. His web site can be found at http://rupert-lloyd-thomas.wikispaces.com/Bodiam+Hill+Climb. 6 October 2013 Val from Harrogate has been in touch with me. Many years ago she was she went out with Lawrence Garrett when he was stationed at Harrogate. She has kindly sent me a photo of her and Lawrence taken at 15 Levetts Lane. The photo can be viewed here (4th photo). Sadly, Lawrence died several years ago and was buried at Fort Pitt Military Cemetery and his gravestone can be viewed here. 11 June 2013 Ralph Salter's memories of Hop Picking at Bodiam added here. Does anyone remember Ralph or his family and the connections he has mentioned? 30 January 2013 Four more photos from Patricia Campe on the Wells Hop Picking Photos page. 24 January 2013 A apology today. Several months ago Bill Regelous sent me a photo taken of his family picking hops at Park Farm. I have finally got around to posting it and it can be found on the Hand Picking page. 22 January 2013 Today we have a new contributor. Patricia Campe (known as Patty Crawley in her younger days) came to Bodiam hop picking with her family and stayed at Crainham Wood and Park Farm camps. She has kindly provided me with some of the family photos and these can be found at Wells Hop Picking Photos. Patricia has also spotted her nan, Jane Wells, in one of the hand picking photos I already have on the site. 20 January 2013 A few more bits and pieces. Robert Elsam has remembered the names of the cart horses. They were Turpin and Trooper but he cannot remember which one was which. He has also identified his father as one of the two men on horses with dogs on the Elsam Family Photos page. Tim and Jeannie have also contacted me. Jeannie has identified her father, Ernie Southurst, along with her mother, Molly, in the Castle Hotel photo on the Doreen Grummitt Family Photos page. Tim has also come up with a possible explanation for the Wilfred Hyde-White photo on the Bodiam Church page. He appeared in a 1955 film called "Quentin Durwood" which was shot in part, at Bodiam Castle. 19 December 2012 A few corrections/additions. Robert Elsam has remembered "Mr Wills" name - he thinks it was Will Osborne. He also asks if there are any photos or memories of the Blacksmith. Doreen Grummitt has let me have the names she knows in the Castle Hotel Photo and has confirmed some other captions on her photo page. 27 November 2012 A new page today courtesy of Caroline Elsam. This is the sale catalogue of the Bodiam Castle Estate 1917. There are quite a few pages so it could take some time to load. 24 November 2012 Julie Dowsing, her father, Edward Catt, and his sister, Kath have had a go at identifying the people in the Castle Hotel photo on the Doreen Grummitt Family Photos page. What do you think? 22 November 2012 Doreen Gummitt has been in contact with me and has confirmed that the photo of three men on the Elsam Family Photos page has her father, Frederick Lawrence, in the centre. She has also identified the other two men. Doreen has also sent me some Bodiam related photos from her family album. I have put these on a new page titled Doreen Grummitt Family Photos. She has also identified her brother, Harold, and her sister, Win, in the 1920s Bodiam Primary School photo. Julie Dowsing has also been in contact regarding the photos on the Elsam Family Photos page. Firstly, she thinks the cottage shown as a cottage at New House Farm is, in fact, the cottage at Bodiam Castle. i am inclined to agree. Secondly, her father, Edward Catt, has identified Charlie Hayward as the carter in the photo of the white shire horse. He cannot, however, remember the name of the horse..
12 November 2012 More photos added to the Elsam Family Photos and the Photos from around Bodiam. 31 October 2012 More photos added to Rother Valley Harriers page. A new page of Elsam Family Hop Picking Photos and a new photo on The Castle Inn page. 30 October 2012 I would like to thank Martyn Lawrence and his sister, Linda, for their continuing interest in the site. Of the last photos I posted of the Elsam Family Photos they think they have identified their grandfather, Fred Lawrence, in the photo of three men. Also, Peter Venner has identified a tar tank at Crainham Wood for Geoff Hubble. Others I would like to thank for their contributions are Julie Dowsing and her father, Edward Catt. I have added a new page of the Catt Family Hop Picking Photos. I have also added more photos to the Elsam Family Photos and the Rother Valley Harriers pages. 11 October 2012 A new page of Elsam Family Photos added. 20 September 2012 A new photo of Bodiam School Pupils from the 1940s on the Bodiam Primary School page. 19 September 2012 Three more photos added to New House Farmhouse page. A new page for Bodiam Village Green. Geoff Hubble has been in contact with me regarding tar tanks (or tar pits or baths - they were called several different names). Essentially, they were for putting a preservative on the base of the hop poles before they were put in the ground. These tar tanks were very much the grimy side of hop work and very few if any photos exist of them. Geoff would be pleased to know if anyone has, or knows of any photos of them. He is also interested in existing tar tanks where they still exist and can be viewed from footpaths or roads. If you have any information please let me know and I will pass it on to him. 17 September 2012 I had a visit today from Robert Elsam who is visiting the UK from Paraguay where he now lives. We had a good chat about Bodiam past and this has prompted me to put some photos of New House Farmhouse on the site. 16 September 2012 A new photo and a press cutting on the Bodiam Angling Club page. 9 September 2012 I have been gathering photos and information about Bodiam Angling Club from Julie Dowsing and Caroline Elsam. The start of a page is now on the site - more to come. 2 September 2012 Julie Dowsing has been in contact regarding the investigative work she has done on the photo of "the Rev F W Martin" getting married - not quite as we thought. All is explained on the Bodiam Church page. There is also an additional photo of the Bodiam Campaigners. 28 August 2012 Martyn Lawrence and Julie Dowsing have been in contact with me regarding the photo of More Bodiam Ladies. Martyn and his sister, Linda, think they have identified some of the ladies, and both Linda and Julie think that they may have an idea of the purpose of the photo. All of the details have been put on the page. 23 August 2012 Some new information on the Bodiam Church page. Three pen & ink drawings of the church and a couple of photos.. All from the Elsam collection. 19 August 2012 Another photo from the Elsam collection today. This is another group of Bodiam Ladies. Can anyone help identify those in the photo? 11 August 2012 A little while ago I met Caroline Elsam (as was) who lived at New House Farm with her parents until 1953. She was also known as "Mop". Caroline was about 11 or 12 when she left Bodiam but still remembers a lot about her time in Bodiam. She also has most of the family photos and I went through these with her, picking out those most relevant to Bodiam. Hopefully, over the next few months, I will be able to put these photos on the site. Today I am statrting with three photos that are not strictly Bodiam but have two Bodiam residents in the photos. These are of the Robertsbridge War Agricultural District Committee. 28 July 2012 Two further additions from David Weekes. These can be seen at the end of his photo album - David Weekes Photos. 15 June 2012 Two new additions today. David Weekes has supplied me with two more photos. These can be seen at the end of his photo album - David Weekes Photos. Robin Quinn has let me have a write up of the Bodiam Bridge Accident. This can be found here. 14 May 2012 David Weekes has been in contact with me. He worked at Udiam Farm between 1951 and 1955. He has sent me some photos he has of work and colleagues. I have set up a new photo album called David Weekes Photos. I have also managed to get hold of a copy of "Voices of Kent and East Sussex Hop Pickers’ by Hilary Heffernan from my local library. They had to order it from another library but there are several copies around. It has some very interesting quotes from hop pickers, many of whom picked hops around Bodiam. 25 April 2012 I have been reviewing the photos I have been given and have found several from Tom and Mary Macey that I have not put on the site. This has been rectified today and I have added photos to Hop Stringing, Northlands Oast and a new section of Photos of Oast Work.. I have also revised the section on New House Oast and added new photos. 24 April 2012 Robin Quinn has been in touch with me again. He writes "..there is a reference to the lorry accident in a book which I just happened to pick up in a library! " The book is ‘Voices of Kent and East Sussex’ by Hilary Heffernan, published 2004"
9 February 2012 Ian Batehup has been in contact with me. He has identified his father, Peter Batehup, in one of the Bodiam Football team photos. Ian's grandfather, Harry Batehup, was Bodiam Station Master until the station closed in 1954. Ian lived in Hunters Lodge, halfway up Bodiam Hill with the water pump close to the steps to reach the house. He attended the Primary School at the top of the hill and recalls a school play that had somthing to do with Christmas. Ian's part was that of Michael, & Shaun Dolan was a Christmas pudding. What really brings this to his memory is Shaun. His line was "I'm a Christmas pudding, piping hot". Unfortunately, it came out "I'm a Christmas pudding & I want to go wee wee". 2 February 2012 Robin Quinn who is doing research into German Prisoners of War in Britain has been in touch with me. Apparently there was an accident at Bodiam Bridge in September 1947 involving a lorry carrying hop pickers that fell into the River Rother. Full details can be found here. Robin would like to know if anyone remembers this incident and can provide him with further information. If you can help please get in contact with me. 23 October 2011 A new Photo Album - Catt Family Photos has been added. Also some press cuttings on the 1986 Bodiam Hill Climb. 22 October 2011 Brian Fuller from Australia has been in touch with me. He is looking for relations to his ancestors who emigrated to Australia from Bodiam in 1838. Full details can be found on the Message Board. 20 October 2011 As it is taking some time to re-organise the hop picking section I have added a new page for Special Picking with a new photo from the Catt family. Also Robert Elsam has provided me with a new link to Bodiam Hill Climb information. This can be found at the bottom of the page. 1 September 2011 The names for the Pancake Race and Bodiam School Photo were supplied by Edward Catt and his daughter Julie. They have also let me have several photos of hop picking from theit family album. I will put these on shortly when I have re-arranged the hop picking section. In the meantime I have put one photo on of Silage Making at New House Farm. 23 August 2011 Some new names and information added to Bodiam Pancake Race photos and Bodiam School Football Photo. "My Father, Robert Crouch, was Cub/Scout Master at Hurst Green from about 1948 until the early 1960s and I wondered, if the Bodiam and Hurst Green Packs had combined for some events. Sure enough, the photo at Batemans - Battle District Cubs, 1956 shows my Father, the last Scouter on the right and I also recognise some of the cubs from Hurst Green. The page 11 photo is also him. I can't recognise the cubs with him, but think he might well be breaking a law if this was to happen today!!!! He is also in the photo on page 20, with Skip Taylor from Burwash Weald leading the Camp Fire sing song. Looking at the St. Georges Day Parades, I think the location of the 1st Photo is Battle, by the Fire Station and the second location is Salehurst, marching from Salehurst Church towards where Salehurst Primary School used to be or the round-a-bout as it is now. Photo on page 15, could that be the old West Pier, Hove? which is derelict now. I also had a look at the Park Royal Football Photo and the player 2nd from left looks like David Catt who used to live at Silverhill, Hurst Green and the player on the extreme right looks like Michael Baldock, who also lived in Hurst Green, but I am not actually sure that they played for that team." Can anyone help in identifying the people mentioned above? 26 May 2011 Terry Brabon has provided me with a letter from the Daily Mirror. Click here to view the letter. Does anyone remember Lily Dowsett? 15 April 2011 Albert Soden has provided me with more memories from Udiam. They can be found here. 11 March 2011 Robert Elsam, who now lives in Paraguay, has supplied four photos of his father, Richard, as Master of the Rother Valley Harriers. There is a new page titled Rother Valley Harriers. 28 February 2011 Albert Soden has been in contact with me. He used to go hop picking at Udiam with his parents. Some of his memories can be found here. Stella Giles has also been in contact and has spotted her father - Ernie Mann in three of the Football Club photos. I have put his name in the Park Royal photo and updated the information in the other photos. 20 February 2011 At last. Some more updates. Two new pages for Bodiam Cub Pack Photo Album and a Cub Jubilee Scrapbook. Four more pages from the Bodiam Cub Pack Photo Album. Three more pages from the Bodiam Cub Pack Photo Album. Seven more pages from the Bodiam Cub Pack Photo Album. Five new pages from the Bodiam Cub Pack Photo Album. A revision to the entry for Bodiam Cub Pack, along with an explanation why and some new photographs..
8 July 2010 Several people have been in contact about some recent additions. Both Jo Smith and John Brimm have added some information Photos from around Bodiam. Martyn Lawrence has identified some people in John and Maggie Burgess's Hop Picking Photos. 30 April 2010 Fifteen new photos of hop picking from John and Maggie Burgess in John and Maggie Burgess's Hop Picking Photos. Three new photos on Winter Preparation. Two new photos on Hand Picking - Measuring the Hops. Five new photos today. Four on Hand Picking and one from a new category Photos from around Bodiam. I need some help on the location of these cottages. Thirteen new photos. Eleven of them are on Assorted Harvest Supper Photographs and two on 1951 Harvest Supper. I am sure you will recognise many of the people who are in the photographs. I think I recognise some of them but I am a bit wary of getting some names wrong. Any assistance gratefully received. Linda Moore has been in contact again. She has named several people in the Guinness Employee Photos, a few footballers and added some information on her fathers involvement in hop picking. Mike Shade has recently contacted me. He was a competitor in the 1963 Bodiam Hill Climb and he has kindly written a short article about his experience and also sent me a couple of photos. I hope you find this interesting as it shows the more dangerous side of motor racing. The article can be found here. Thank you, Mike, for sharing your experience with a wider audience. I have also added another photo, supplied by Mike Armitage, on the Guinness Employee Photos page. Two new photos on Hand Picking - Collecting the hops. Also Mike Armitage has been in contact and has spotted his father in one of the Guinness Employee Photos. Two new photos of irrigation on In the Summertime and some new photos of hop gardens around Bodiam. Nine new photos on a new page Guinness Employee Photos. I need some help identifying some of the people. Four new photos all supplied by John Brimm. The first is a Bodiam School photo from about 1920. John has identified his relations but there are many more. Can anyone help identify people? There is also another Bodiam Hill Climb photo and two of Bodiam Scouts. 19 March 2010 Five new photos on the Bodiam Football Club page. 11 March 2010 Two new photos of Bodiam Hill Climb and some comments on two photos of unknown groups, all supplied by John Brimm. 13 February 2010 A leaflet advertising the Castle Inn supplied by John Brimm on the Castle Inn page. 20 January 2010 Several new additions today, all supplied by Mike Armitage. A new picture on the construction of Levetts Lane, a new Guinness Time cover along with an article on Hop Growers Diary, photo of Bodiam Football Club and a photo from the Castle Inn all from the Christmas 1960 edition. There is also a new photo of Ockham Oast. 11 January 2010 An update on a couple of photos. Linda Moore (nee Lawrence) has been in contact and has spotted herself in the group photo in Levetts Lane. She has also identified most of the people in the photo. Linda also thinks that one of the unknown groups photos may well be a party for the Coronation held in a small hall in the castle car park. Did they have a bar in this hall as I spot a hand pump in the foreground of the photo? 8 November 2009 Four new photos, one of Hop Picking, one a group in Levetts Lane and two unknown groups. Any help in identifying people and occasions greatly appreciated. 6 November 2009 New photos of Harvest Suppers on Harvest Supper Photographs and 1950 Harvest Supper. Also Anthony Breeds has shown the photograph of Bodiam Ladies to his mother, Edna. She has identified herself and clarified some other names. 17 September 2009 Two new photos which I need help in identifying people. The first is Bodiam Ladies and the second is a new photo at the bottom of the Castle Inn page. 16 September 2009 A new section on Bodiam Hill Climb. Does anyone have any more photos, programmes or memories? 15 September 2009 Two more people have contacted me with some names for photos. Firstly, John Burgess has identified his uncle, Raymond (Bunny) Lawrence, in the First Aid on Guinness Hop Farms page. Secondly, Rosemary Weddle has identified two people in the birthday party photos on the People page. She also tells me that Nina on the Pancake Race page is married to Frank Blanch. Martyn Lawrence recently sent some documents the family found and thought would be useful for the site. One item was programme from the dedication of the Bodiam Church Bells by the Bishop of Chichester. The programme can be found on the Bodiam Church page. 8 September 2009 Another Bodiam Memory added. This is from Pat Doyle who now resides in Canada. He e-mailed me a few days ago giving me brief details of his time as a measurer in 1955. He very kindly put down his memories and also sent a couple of photos. These can all be found here. On the back of one of the photos it says "Barnfield 1955" which I think is now known as Ockham. What I find very interesting about Pat's memories are that they are from an "outsider" who had not previously been involved in hop picking and did not know any of the Guinness staff. My reading of Pat's memories are that it was an enjoyable bur testing time, especially for a young 21 year old. I would like to thank Pat for providing this interesting insight into the work of a measurer. 5 September 2009 A new section on First Aid on Guinness Hop Farms. Is anyone able to help with identifying people or occasions? 3 September 2009 Four new birthday party photos in People. 2 September 2009 A new section added - Bodiam Memories. My thanks to Mike Armitage and Martyn Lawrence for the first two. Does anyone have any more I can add? 9 August 2009 At last! I have finally got around to updating the site. Today I will concentrate on some of the people who have contacted me with information. Anthony Trussler has been looking at the Pancake Race photos and has identified the District Nurse who lived next door to them at 20 Levetts Lane. He remembers her name as Nina but cannot remember her second name. His mother is also on the case and is trying to jog her memory. John Brimm contacted me and somewhat "tongue in cheek" complained of not having any photos of him on the site. He did, however, identify his brother, Richard Brimm, in the 1957 Bodiam Cubs photo on the Bodiam Scouts and Cubs page. 5 March 2009 Two new photos on a new page for Bodiam Church. Can anyone help with identification of people, occasions or dates? 22 February 2009 Four new photos of the Pancake Race added today. I need some help with some of the participants. 19 February 2009 Michael and Rosemary Weddle have just sent me some photos from the Weddle family album. As a starter today, there are five new pictures of Bodiam Scouts and Cubs. 31 December 2008 Four new photos of Levetts Lane, three of them featuring me can be found here. Also amended names in Bodiam Primary School Play 1956 courtesy of Nick Collins who has identified his mother, Marie Trussler. 13 December 2008 Further details of camp life and in the hop garden for Visiting Hop Pickers added here. Also new photos of Ada Catt hop picking here and New House Oast here. 11 December 2008 New page about Visiting Hop Pickers added here. 7 December 2008 Keith Matthews has been in contact and has spotted himself in one of the scout photos. He has also identified a couple of other people in the photos and given me some background information. Thank you Keith. The photo is on the Scouts and Cubs page. 22 February 2007 An article from the National Trust Spring 2007 South East News on Bodiam Home Guard and Tom Weeks. 24 December 2006 Three new photos on the Scouts and Cubs page. Can you help identify some of the people? 17 November 2006 A few more Guinness Time Articles added. Stephen Foster has also contacted me. He lives in Colorado in the USA and has confirmed that he is in the Cubs photo. 5 November 2006 Nothing new added to the site but I came across a site about the "Guinness Clocks" in the 1950's. This may bring back some memories for those old enough to remember them. Click here to go to the site. 3 November 2006 Another article from Guinness Time Articles which is also a Harvest Supper 1972. 25 October 2006 Some new articles added from Guinness Time Articles and Guinness Time Covers renamed. 16 October 2006 Some early front covers of Guinness Time Covers added. 15 October 2006 Some new Press Cuttings for March to June 1929 added. 8 October 2006 At Last. I've final got around to putting the links to the hand picking pages. These can be found at Filming in the hop garden, Around the bin, Measuring the hops and Press articles. I've lots more to put on and tell you about connections to the site. Now the darker evenings are here I will try and update more regularly. 30 November 2005 A further four photos showing work In the Oast and three new photos in To the Brewery. 22 November 2005 A new photo of Ockham Oast here. 19 November 2005 Two new photos of a Bodiam Primary School Play on Bodiam Primary School page. One new photo of Bodiam Cubs on Bodiam Scouts and Cubs. 9 November 2005 Several more photos on "In the summertime"
7 November 2005 Two new photos on Winter Preparation of manure spreading and string winding. One new photo of Johnny Hook Stringing. One picture in the section "In the summertime"
6 November 2005 Sorry for the lack of recent postings. Today there is a series of photos on erecting a hop garden. These can be found at Erecting a Hop Garden under Winter Preparation. These photos along, with many more, came from Mick Breeds who collected them as part of his studies in the early 1960s. I would like to thank him for his efforts in copying them and sending them to me as well as letting me have descriptions and the text of his studies. Hopefully I will be able to put them on the site soon. His brother, John, has also told me their father (Denis) is in the back row of the 1956-57 photo of Bodiam Football Club. 25 August 2005 A collection of photos of Bodiam Primary School in the 1960s. These can be found on Bodiam Primary School. Firstly, an apology for not posting any additions for so long. Secondly, a big thank you to all of you who have been in contact with me in recent months. In particular, I would like to thank Mick, John and Julian Breeds for their support and assistance (and their mother for spreading the word about this site).